Excess moisture is very common among households, creating an unfriendly environment resulting in a damp, mildewed smells, condensation, mold growth, damaged wood, and shedding wallpaper and paint. This is why investing in the best dehumidifier in India is a good option as it serves as your defense mechanism against high humidity conditions around your property. And in this buyer’s guide, we will tell you exactly how to find the right one. Powerpye 3-in-1 Dehumidifier: Not only will this dehumidifier efficiently kill the excess moisture in your room with its top of the line features but also act as a clothes dryer and an air purifier. So if versatility, easy portability, quiet operation and ease of use are the features you were going for, this is where your search ends. Pro Breeze PB-02-US: Need something even more compact and cheaper? The Pro Breeze removes 250ml of moisture in a day and has a 500ml Water tank which makes it the ideal dryer for smaller spaces like the bathroom, garage, closets etc. Are you looking for an energy efficient and less noisy dehumidifier? The PowerPye is more than just a dehumidifier making it one of most versatile units you will come across (there’s plenty to love about this one). Depending on the humidity of your room (easily visible on the LED display), you can the humidity control anywhere between 40-80%. And once the set levels are reached, the fan automatically shuts down and restarts again when need be so you save a few bucks on the electricity bills. You can also set the fan to oscillate between 45-90-degrees so the dehumidified and pure air efficiently reaches every corner of the room. Its 5.5-liter water tank ensures you do not need to need to empty it out every couple of hours. But what if you forgot to check that tank? Well, nothing to freak out about, the dehumidifier has an auto-off feature once the water tank gets filled or even if it gets overheated. And in case you do find the tank filling up quickly on the more humid days, you also have the option of attaching a hose then drains the water into a nearby by drainage, sink or even into a larger bucket. Remember we told you it is a very versatile unit? That is because it also comes with Clothes Drying and Air Purifying Mode. So you won’t just have a dehumidified room but also fresh, allergen-free air to breathe and even have your important clothes dried in a jiffy. Oh, and you can also replace the existing filters with HEPA filter which can further improve air quality by capturing the minutest of particles. Plus, there is also the auto-mode where the dehumidifier automatically adjusts the humidity range, oscillation etc. In this mode, it even turns on by itself in case of a power cut (just the kind of mode perfect for the kids or old parents room). It also has an auto-defrost feature which means it requires little maintenance on your part the (a true set it and forget it dehumidifier). The buttons are nimble to use and the backlit LED display gives you all the required details and is clearly visible even in the dark. And lastly, it has noise levels of less than 50dB so it will neither be disturbing your sleep or work. Emptying out the tank manually can be tedious but you can always get a hose pipe for gravity draining if you sink or floor drainage nearby. Also, it only turns off automatically in case of a power cut when in auto mode other you will need to it manually. Lastly, it is on the expensive side but with features like that, we promise you will have your money’s worth within a few days. Is a high level of humidity playing the villain is your workspace? Or do you need a power-packed humidifier for the whole house? Well, the Whynter RDP-702WP is just the superhero you need. The Whynter can efficiently clear up to 33L of moisture from rooms as big as 3800 sq. ft. which makes it ideal for offices and larger houses (even in winters). To give you full control over the moisture levels in the house, the dehumidifier has an excellent adjustability range of between 30-90% and 2 fan speeds as well. Once it reaches optimum humidity level, the compressor and fan shut down and only restart when humidity levels reach within 10% of the desired level in order to lower energy consumption. And if that wasn’t reassuring enough, you will be happy to know it has an energy star rating as well (performance + energy efficiency = always a winning combo). With an 8.5-liter capacity, the tank need not be emptied even for an entire day or days. And even when it needs to be, you can simply remove it and have 8.50-liters of water for the plants, cleaning etc. And do not worry about the tank overflowing as it will shut-off automatically after a certain point. But does emptying it out manually sound too tiring? Well, luckily for the lazy you and me, there is also a 3ft gravity drainage hose which means the tank never fills up. For even more convenience, you can also opt for the 16ft condensate pump drain hose (always my go-to method). If you would like the dehumidifier to stop at a particular time, there is always the timer you can use. Then there is also the comfort mode where the dehumidifier automatically sets the ideal humidity range and operates at a lower noise level. And with the memory function, the dehumidifier will always begin at the previously set mode and settings in case of a power cut (just the feature you need for overnight running). Lastly, there is also the continuous modes where the dehumidifier never shuts off (a mode larger offices will most likely need). Even with all that power, the humidifier remains lightweight and comes with caster wheels for easy movement. The auto-defrost system ensures you never have to manually deal with the frost buildup. There is also a washable filter that clears bacteria from the air which means, to a large extent, it also acts as an air purifier for your home and office. For traditional air purifiers, check out our post on the Best Air Purifiers in India. And lastly, the Backlit LED display removes any kind of guesswork so always know the humidity levels, mode etc. It can be a bit noisy (nothing too disturbing though) and also comes at a higher price but has features absolutely worthy of that cost. Clears 33L of moisture in a day from spaces as big as 3800 sq. ft. The large LED display shows humidity levels, mode etc. For anyone looking for a commercial-grade dehumidifier, this is, simply put, the ultimate buy. Need something cheaper and compact for your closet, bathroom or small storage space? Say hello to the Pro Breeze PB-02-US Dehumidifier. The Pro Breeze can capture about 500ml of moisture from an area of 100 -130 sq. ft. and thus, is perfect for most kitchens, bathrooms, smaller rooms like the baby room or a caravan. What also makes it perfect for your kid’s room or your caravan is the Whisper Quiet Operation. So how does that? As the name says it, it ensures the dehumidifier operates all day all night long at the lowest possible sound level, lower than 35dB to be precise (as quiet as a dehumidifier can be). It also features a 500ml tank which can be easily removed and emptied out once it is full. But how will you know the tank is full? Simple, there is a red light turns on when the tank reaches its full capacity. Plus, the dehumidifier automatically turns off as well to prevent any leaks or spills. For a light and compact dehumidifier on the cheap, it is surprisingly durable and can easily last you for years. As I have already mentioned plenty of times, it is super compact and lightweight thus moving it around should be a menial task (can be picked up and carried in one hand). For starters, there are no modes, no fan speeds or an adjustable humidity range. The dehumidifier runs constantly but no worries, it barely consumes any electricity. Also, if you run the dehumidifier the whole it, you will need to empty out the tank quite frequently. Removes about 500ml of moisture from areas of 100-130 sq. ft. This makes it well-suited for small rooms, kitchen, caravans, bathrooms etc. 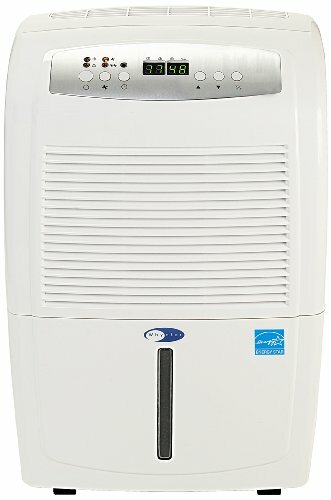 All in all, if you need a no fancy-frill and compact dehumidifier that you can place anywhere (even in your car) on the cheap, the Pro Breeze PB-02-US is the best dehumidifier in India for you. 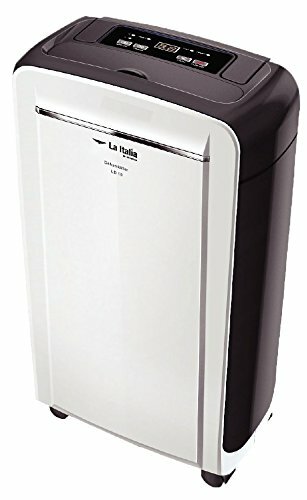 Another great dehumidifier for medium to small rooms, the La Ittalia LD 10 comes with all important basic features that make it an excellent mid-range buy. The LD 10 has a daily water extraction capability of 10L to give you a room free of dust mites, mold, and even mildew. Works efficiently in rooms between 150-250 sq. ft. and draws minimal energy so you can use it all day long without any issues. And one of the reasons for that is because the fan stops up reaching desired humidity range. That range can be set between 40-80% using the control on top of the dehumidifier (you want a particular level of humidity in the room and you get just that). Plus, with the 2 fan speeds, there will be no hotspots in the room. The 2-liter water tank should give you uninterrupted running for at least 4-5 hours before it fills up. But when it fills up, you can rest assured the water does not spill out on the floor or carpet (not even a drop, we promise) as the dehumidifier automatically shuts down. Once the tank is full, simply attach a pipe and drain it out or remove the tank and make better use of the water by watering the plants, washing the utensils, mop floor etc. Defrosting the humidifier is not your problem as it that is handled by the dehumidifier itself thanks to the auto-defrost feature. Wheels at the bottom mean a light push and you can easily move the dehumidifier to a different room. The LD 10 can be a little noisy but not enough to wake you or your family up at night. Also, the 2-liter tank needs regular emptying. Lastly, it lacks some of the high-end features like memory function etc. that the other high-end models like the PowerPye have. 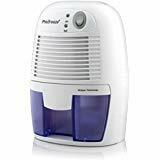 Ideal dehumidifier for rooms of about 150-250 sq. 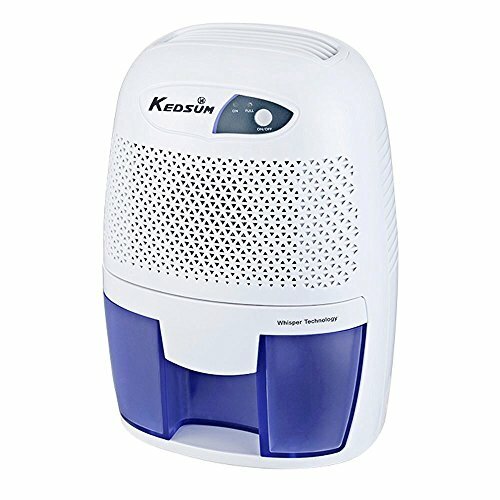 ft.
Another decent budget product, this dehumidifier from Kedsu is also compact, light and ideal for small rooms or closets. With the power absorbing 500ml of moisture from the air in 24-hours, this dehumidifier will sit comfortably in the smallest of spaces (cupboards, bathrooms, drawers or even the car or RV, it fits in anywhere up to 108 sq. ft). And you wouldn’t even realize it is there since it makes little to noise all as it has been equipped with the Whisper Quiet Technology. The 500ml water tank takes only a few seconds to empty out. Pull it out, throw the water and push it back in (easy peasy, just like it should be). And every time the tank fills up not only does the dehumidifier shuts down but there is also a light indicator in the front to warn you about it. It weighs a mere 1kg and is just a little bigger than a smartphone so you can lift and put it anywhere you would like. The anti-skid mat at the bottom keeps it rooted to the base and prevents it from easily slipping and sliding when in operation. This further helps prevents water leaks or drips or breakage. The humidifier is only suitable for smaller spaces and will have little to no effect in areas larger than 108 sq. ft.
Also, the tank needs emptying on a regular basis if you used at a stretch and the plastic build is slightly less durable. And lastly, you do not have any control over the functioning. From fan speed to humidity range, the dehumidifier works at default settings. Ideal dehumidifiers for RV’s bathrooms, closets etc. You get no control over speed, humidity range etc. Who Should Use a Dehumidifier? Seeing mold spots on the walls or ceiling of your home a lot? Always smells a stale damp odor? Noticed a gray or white level stain in your basement? You might need a dehumidifier. …the use of a dehumidifier is specifically important. Over the season, your home generally collects moisture as soon as summer arises. This eventually leads to problems winter and autumn when you close your home up. A dehumidifier prevents these annoyances and increases ventilation. What makes dehumidifiers highly crucial? Know their top-notch benefits below! Mildew and mold flourish and breed in humid, hot conditions, with kitchens, basements, and bathrooms as the targeted areas. By running a dehumidifier on a regular basis, you can keep these areas mold-free and dry. It also gets rid of dust mites in an instant. Spiders, centipedes, silverfish, cockroaches, and other types of household pests yearn for a humid environment. Keeping a drier area repels these infuriating critters and preventing them from occurring again. Good indoor air quality is very essential for our health, and a dehumidifier can help us to achieve it (of course, aside from air purifier). It is, in fact, not possible to maintain a quality air at a healthy level if there’s too much humidity. Most dehumidifier units have an Energy Star rating. This means it can be able to run cost-efficiently helping you save more on your energy bills. Buying a dehumidifier is like hitting two birds in one stone: one product with two important purposes – that is creating a healthier environment and saving money in the long run! A home with a high humidity level is likely to destroy its structural integrity. Moisture affects the wood inside the home, which results in the crack, split, or warp. Wood is not only the one that is prone to damage but the metal as well. It may begin to rust over time. Prevent your house from slowly deteriorating with a dehumidifier. To help narrow down your choices, the following are the important factors you need to take into account before buying a dehumidifier for your home. Simply putting it, larger machines can dehumidify more area than smaller ones. If you own a commercial building, investing in a bigger dehumidifier makes more sensible. If you intend to move the unit from one place to another, look for a dehumidifier that is lightweight, compact, and has rolling casters or a carrying handle. Popular features to look for include automatic humidistat, automatic restart, electronic controls, programmable timer, automatic defrost, low-temperature options, and more. A rule of thumb, the more water a unit can hold and extract, the more it can cost. A dehumidifier with a washable or removable filter traps particles and airborne dust. This makes maintenance easy. All you have to do is pull out the filter, wash with water and mild soap, and put it back. The noise level differs depending upon the model. Dehumidifiers with 2-speed fans operate quietly at lower humidity levels. Not to mention, they save on energy expenses. If you want to save big on your utility bills, look for a unit with Energy Star label. This certified government-sponsored label is guaranteed to use less energy but works efficiently. Most models are user-friendly. To make your life easier, make sure to look for a unit with water level control to avoid overflow, full tank light that notifies you when it’s time to empty the tank, etc. How much are you willing to spend? A dehumidifier is not a simple investment. For mini units, many types can range from below $50. If you opt for basement models, ensure to have at least $300 in your pocket. Compressor: Powerful, effective, and durable. It works in rooms where the temperature is 10-15° C.
Desiccant: Operates in temperature between 1 and 30 degrees. A quite model and is very useful in high humidity spaces like bathrooms. 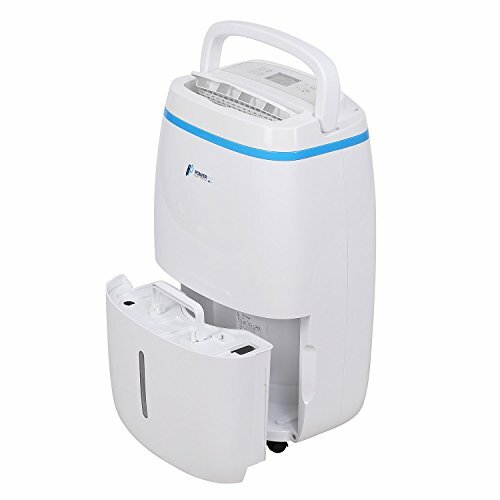 Mini Dehumidifier: A convenient tool if you want to keep places including storage boxes, drawers, and wardrobes. Industrial/Commercial: Ideal for huge areas such as warehouses and offices, thanks to its moisture removal capabilities. We hope that we’ve provided you with all that you might need for finding the right dehumidifier. Just focus on the things tackled here to get yourself the right product you want.